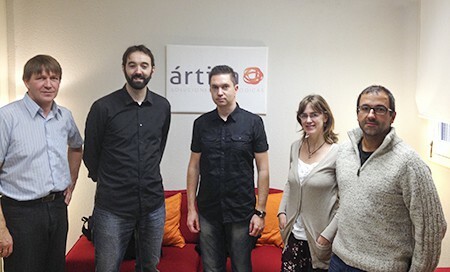 This week we have the honor to receive a visit from a delegation of Estonia in our headquarters in Madrid. Estonia is a small country of around 1.3 million population, located in the east of Europe and characterized for having a great technical skills and high levels of entrepreneurship among the younger population. The reason for his visit was to locate different companies interested in participating in the Internship Students Technical Schools (Vocational Educational Centers) of Estonia, the equivalent of the FCT internships (Training Workplaces) in Spain. Both programs are mixed with the rest of UE countries in the Erasmus Program, which now includes not only Universities but also technical schools. This is great news, because in the last 5 years, the percentage of young people who have chosen the path of professional training rather than the University has grown unusually and thus, a big number of students could have access to the benefits offered by this renowned Scholarship. Students coming from Estonia will play with advantage, since, according to the latest ranking of Non-English Speaking Countries Level held in September of this year, students from Estonia are in the 4th position right after Sweden, Norway and Holland, leaving back countries such as France, Italy, Portugal and Spain, currently ranked number 23. So, for all those who work in Artica ST, this is an excellent opportunity for students from across Europe to do the internship in our company, which has always had a strong international focus and is open to teach anyone who is interested in learning. We hope this spring we will have our first Estonian internship student to help us translating the Pandora FMS Console into Estonian. Meanwhile, we will wait enjoying the delicious chocolate they have brought us as a gift. Thank you very much to all of you and best regards to Andrei and Margus.